Dancing also pop up in place names, such as the Chachacharoad in Lusaka (Zambia). Apeldoorn parties considerably along with the Mazurka Street, Saraband Square, Avenue of the Charleston, Tango Street, Polka Street, Calypso Street, Samba Street, Valetastraat, Gavottestraat. 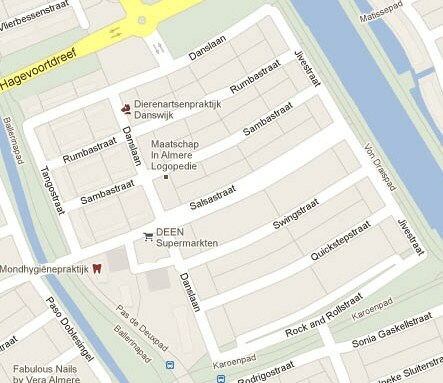 And Venlo has a Mambo Street, Rumba Street, Polka Street and Samba Street. Purmerend has a Rumba Street, Bossa Nova Street, Limbo Street, Mambo Street, Salsa Street, Tango Street, Milongastraat and Habanerastraat. Charleston is a city in the United States of America, capital of the state of West Virginia. But there is also one in the states of Arkansas, Illinois, Mississippi, Missouri, South Carolina, Tennessee, Utah, West Virginia; and outside the US in Ireland and South Australia. Some names for a dance are not only a place name, but (also) a different meaning. Twist is a town in the German district (Landkreis) Emsland, Lower Saxony, on the Dutch border. But twist also stands for the number of turns per unit length, the twisting of yarn. Charleston is also an English boy name. Tango was a former province of Japan, but also a drink, a mix of beer and grenadine. Tango indicates in the international spelling alphabet The letter T.
With salsa, Spanish and Italian word for `sauce`, (usually spicy) sauces are ment from Latin American cuisine. Many salsa`s are prepared with raw ingredients. Popcorn is known as puffed corn grains that are eaten as a snack. A boxing punch or a stroke or swing in the golf can be also be a swing. Disco stays in style and is an abbreviation of a disco dancing or dance tent. Some terms are a bit corrupted and confusing. A meringue is an airy meringue of stiff whipped egg whites with caster sugar. Sometimes is also used the name Merengue, although that refers to the dance.